Blue cohosh has been traditionally used for women's health issues. Some parts are safe, although the plant can also be toxic and should be handled with care. Blue cohosh is a traditional Native American herb that grows in woodland valleys in eastern North America. To propagate, the plant needs north-facing slopes and damp banks. It should not be confused with the far more popular black cohosh - these two plants are not botanically similar and yield very different medicinal benefits. Although it is not a largely popular modern herb, it is still used in herbal medicine for treating gynecological conditions and arthritis. The primary constituents of blue cohosh are alkaloids and saponins, namely magnoflorine and caulosaponin. Of these, the ones that influence blue cohosh's medicinal properties the most are caulosaponin and caulophyllosaponin. The root also contains caulosapogenin, a closely-related steroidal saponin. Other significant alkaloids include laburnine and magnoflorine. The natural diuretic and antispasmodic properties of blue cohosh have allowed it a niche in traditional medicine. Research has shown that caulosaponin is responsible for encouraging menstruation. It works by stimulating uterine contractions and promoting blood flow to the pelvic region via is oxytocic effects. Laburnine is a toxic substance within the plant and one of the reasons the berries must not be consumed. Additionally, blue cohosh's toxicity can be attributed to the nicotinic alkaloid N-methylcytisine, which is found in all dietary supplements of blue cohosh that have been analyzed. Emmenagogue properties are also present in motherworth and angelica, whereas peony and rose help relieve joint pain. It should be noted that the aerial parts of the plant are toxic to eat, and only the underground rhizomes and roots are used for medicine. Blue cohosh should not be consumed during pregnancy, as it can cause abortion and malformation of embryo and fetus in the womb. Due to its toxicity, blue cohosh is not consumed as food. However, herbal preparations can be made at home in order to reap the medicinal benefits of this herb. The berries must never be eaten, but blue cohosh roots or rhizomes can be consumed as a tincture or a tea. This must be done with caution and after speaking to a doctor. A blue cohosh tincture can be bought as a menstrual pain and arthritis treatment, and it allows for a more convenient and accurate form of consumption than blue cohosh tea, especially for short-term or one-time treatments. Because of the potentially toxic nature of this plant, it is important to go to a trusted merchant, or to verify that any tinctures or tea bags purchased are made solely from the plant's roots, and never from the berries. Liquid herbal extract or blue cohosh capsules can be bought in online or in specialized health stores. They are generally taken as a dietary supplement to support smooth muscle relaxation, stimulate menstrual blood flow, and ease painful menstrual periods. 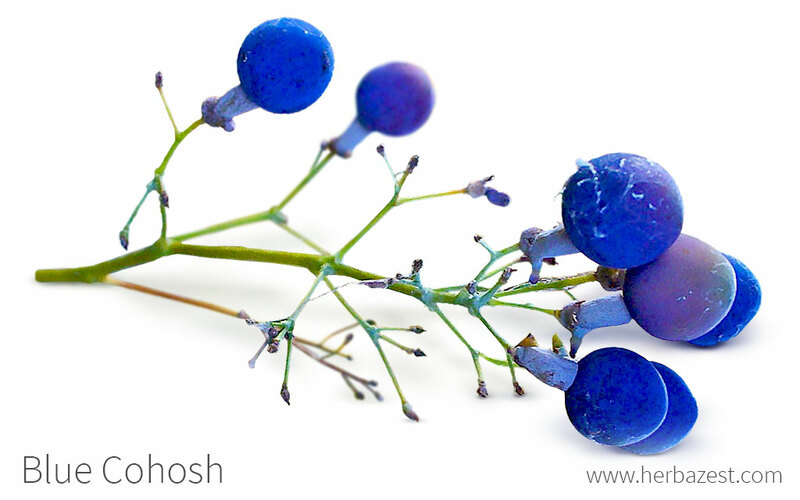 It's essential to verify that blue cohosh products are made only from its roots and never from its poisonous berries. Blue cohosh grows naturally in damp woods and bottomlands and can reach up one to three feet (30 – 91 cm) in height. It is an ornamental plant that can be used in shaded areas or woodland gardens. Unfortunately, there is a long period before germination, and so blue cohosh cultivation is not for the impatient. Growing blue cohosh successfully involves keeping it shaded as much as possible - ideally in a mixed wood forest, or at least among trees. The soil should be slightly acidic and very moist and cool. Blue cohosh seeds should be cleaned of their outer coat before being planted 1/2 an inch (1.3 cm) deep. Blue cohosh needs plenty of mulch or rotted vegetation to grow to its full potential. Blue cohosh can survive cold winters well, as long as fallen leaves are left to protect the root. Copious amounts of water will allow many blue cohosh plants to grow in close proximity. The brown rhizome grows very close to the surface and the bluish stalk will rise in spring, but if the plant is wanted for medicinal purposes, it is advisable to wait until September to dig up the roots. The striking and beautiful blue cohosh plant bears purple-blue flowers that are surrounded by three purple-blue stems that divide into leaves at the top. It is a reasonably tall plant, growing to heights of around 3 feet (1 m). The root and rhizome is generally lifted in autumn and dried for the medicinal benefits. Blue cohosh (Caulophyllum thalictroides) is part of the Berberidaceae or barberry family, which comprises more than 650 species across 15 genera distributed in temperate zones of North and South America. Another well-known member of this family is Oregon grape (Berberis aquifolium). Caulophyllum, a small genus of perennial herbs, it is is well known for its diversity and pharmacological uses in traditional medicine system since ancient times. The three recognized species in this genus are very similar: C. robustum is native to eastern Asia, especially China, while C. thalictroides and C. giganteum are native to eastern North America. It is worth noting that nearly all phytochemical and pharmacological studies on this genus are focused on C. thalictroides and C. robustum due to their important medicinal functions. There are two different varieties of Caulophyllum thalictroides that have been identified by botanists so far. These are C. thalictroides var. thalictroides, the most widespread one that typically presents a combination of blue and yellow flowers; and C. thalictroides var. giganteum, which is usually limited to the northern end of the species's range, has larger sepals and longer pistils, and may sometimes grow purple flowers. The history of blue cohosh started with Native American tribes, who first discovered its use to facilitate childbirth and prevent pregnancy. Information about blue cohosh and its benefits were given to early European settlers. Although the blue cohosh market is small, it does exist. Blue cohosh trading is not highly profitable, however, so there is no notable industry surrounding the plant. In September 2013, the price paid to wild harvesters was a mere $1 USD per dried pound of root. With these small returns, selling blue cohosh is generally something done by private property owners in order to manage the wild populations rather than to make a profit.